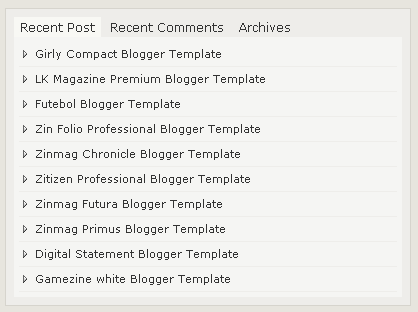 To add a nice multi tab section to your blog follow the steps given below. event (and not to the tabberObj). Note : Host bullet.gif image yourself. Replace ENTER-TAB-1-CONTENT , ENTER-TAB-2-CONTENT , ENTER-TAB-3-CONTENT with your content. I know your blog from Blog Catalog, where I have promised to visit your blog and give comment. Your blog provide technical information about blogging, thus it would be attractive for IT people. If you want to get more people from different walks of life, then you should write not so technical. Also place a shoubox or chatbox widget so that visitors can leave messages directly and easily, thereby you would know them and can visit their blog. Join many online networking media and visit and follow other blogs. Perfect Works well Thanks a lot i have been searching for Multi Tabbed Widgets ... !!! i dont understand..how i insrt tabber tab...in my blog theme..